Forestry Tasmania’s over cutting of Tasmania’s native forests has been exposed in the leaks around the independent analysis of wood supply contracts as part of the Intergovernmental Agreement, Australian Greens Deputy Leader Christine Milne said today. “What has become clear is that Forestry Tasmania has overcut and over allocated the forest to such an extent that even with the retirement of two thirds of its contracted volume via Gunns, Forestry Tasmania cannot meet the remaining one third of its obligations. “With an annualised shortfall of 39,000 cubic metres of veneer logs, what would have happened if Gunns and TA Ann were both still in the market? “Forestry Tasmania would have been hung out to dry and one or other or both of the companies would have sued for breach of contract. “Forestry Tasmania must be disbanded beginning with the Board which has overseen reckless destruction of forests, overcutting, over allocation in contracts and financial failure with the $18 million losses over the past two financial years. “It is time for the Board to explain why it permitted the over allocation of the forests and then the overcutting whilst pretending that the forests are sustainably managed. “Forestry Tasmania and Ta Ann should apologise to the forest activists who have been telling the truth about the forest practices that underpin their contracts. “Far from being sustainably managed, Forest Practice Authority chief, Graham Wilkinson has made it clear that Forestry Tasmania’s current practices do not meet scientifically based requirements for the protection of threatened species. “Forestry Tasmania has argued throughout the process that, provided it can continue to ignore scientifically based requirements for the protection of endangered species, it could still meet its contracts until 2030 provided no more areas were protected. “Now we know that is a lie. It cannot. Even with no reserves, and unsustainable practices, Forestry Tasmania cannot fulfil its contracts from native forests. DAN Caffrey (Letters, 13/2) makes the reasonable point that "use of a waste resource can only be good for everyone, so long as the practice does not encourage harvesting of native timbers for the sole purpose of producing biofuels." Unfortunately, that is exactly what it does mean. We bought this argument about making good use of sawmill waste when woodchipping began. Some decades later - seeing half the biomass of demolished forests left on the ground to be incinerated, and 90 per cent of the logs that were taken out being chipped rather than sawn - we swore never to fall for that one again. This move is about finding a new excuse for the maceration of our forests, and adding insult to injury by having it blessed as a source of green power. AS SEVERAL letters note (The Age, 13/2), the two independents' decision to allow the burning of forest waste to count as creating renewable energy is a bad one for many reasons. The main reason, however, is that it is not sustainable. The removal of so much organic matter means a progressive decline in the quality of forest soils. The leaves, twigs, small branches and sawdust left on the forest floor gradually break down to form a layer of humus that returns nutrients to the soil, improves its texture and protects it from erosion by wind and rain. This material helps the soil retain moisture, so that it acts like a giant sponge, holding rainwater and only slowly releasing it over many months. By contrast, after clear-felling, rain runs off from bare ground. If we remove material from the forest floor, we are gradually running down our forest soils; the depleted forests will decline in quality and produce less and less (rain, timber) each passing year. IN ADDITION to Rob Oakeshott's and Tony Windsor's support for burning native forest wood waste, which will lead to more greenhouse gases, federal Labor announced support for a new brown-coal and gas-fired power station in Victoria (''Ferguson grants extension for contentious power plant project'', The Age, 10/2). Such a station would belch out copious greenhouse gases for some 40 years. The carbon tax that was supported by the independent MPs is trying to achieve an 80 per cent (based on year 2000 emissions) cut in Australia's greenhouse gas emissions by 2050. Please, let's have some consistency. THE intention of Rob Oakeshott and Tony Windsor to allow native forests to be burnt to generate electricity is a backwards step. Support for the ailing native forest wood-chippers would be better transferred to truly renewable sources of energy including wind, solar and geothermal. Burning native forests for power sends our best carbon stores skywards, making climate change worse. If forest furnaces are allowed, this country's moves to a cleaner economy will be jeopardised. 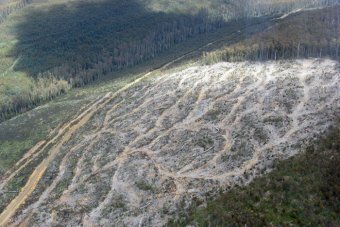 ASHLEY HALL: An independent report has found that the Tasmanian forest industry is under severe pressure because of the collapse of international woodchip markets. The report concludes that a series of factors have led to the collapse of woodchip exports to Japan and the Government can't say when new markets to China are likely to emerge. Compounding the situation, the state's only native forest woodchip exporter has temporarily shutdown, forcing some sawmillers to lay off staff. Joining me now is our Hobart correspondent Felicity Ogilvie. Felicity, you've been at a briefing with the Premier this morning. What has he said about why - what she said - about why these woodchip markets to Japan have collapsed? FELICITY OGILVIE: Well, Ashley there have been various reasons why the woodchip markets to Japan have collapsed. At the forefront is the forefront is the fact that Tasmania used to export a lot of native forest woodchips but the Japanese customers now prefer plantation timber because it makes better pulp. There are other significant factors as well. The high Australian dollar is one and there has also been factors that weren't specifically mentioned in this report but about environmentalists campaigning against the Tasmanian forest industry in Japan. ASHLEY HALL: Now the woodchip market is a big employer in Tasmania. What effect is this having on the industry and job security there? FELICITY OGILVIE: Well, it is have a shoot impact at the moment because woodchips are actually a by-product from saw logs, things that make flooring or timber that is used in the construction industry or to make people's kitchens. And what has happened is that saw mills around the state that are cutting up saw logs, they can't export their wood chips at the moment because the only native forest woodchip exporter in the state has had to temporarily shut down because it simply cannot have the markets it needs to export the woodchips. So the Premier estimates that it could be up to 3,000 jobs on the line in the native forest industry in Tasmania at the moment and she said that there is even if the woodchip exporters could reopen up in Tasmania, that the situation is dire because the markets aren't there at the moment. This is a bit of what she had to say. LARA GIDDINGS: Because the problem is, we don't have the market to sell the woodchip to, though we are hopeful that we will be able to sell woodchip to China but we need to be able to sell it in the volumes that enable our industry to be sustainable and for the foreseeable future, that is not looking very likely. ASHLEY HALL: Tasmania's Premier Lara Giddings. And Felicity what is the Government doing to address the situation? FELICITY OGILVIE: Well Ash, in the future the Government can't say when it will be but it looks like there will be quite a strong market for Tasmanian woodchips in China, but at the moment the Chinese aren't paying enough to have that as a sustainable option. But the Deputy Premier is going over to china and Japan to meet with different companies to I guess spruik the Tasmanian market over there in a hope that that could in some way solve this problem with woodchip exports from Tasmania. ASHLEY HALL: Felicity Ogilvie, thankyou for joining us from Hobart.